Three new Philips soundbars to beef up your TV's sound | What Hi-Fi? If you want to discreetly boost the sound of your TV, Philips has three affordable new options. 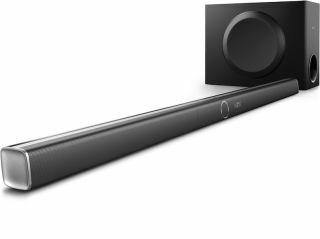 Philips announced three brand-new soundbars at IFA 2015 in Berlin today, each designed to bring some substance to your TV's sound without drawing attention to their appearance. The HTL5160B, HTL3160B and HTL2183B all feature HDMI output with Audio Return Channel for fuss-free connectivity, and each has Dolby Pro-Logic II surround-sound decoding on board. All are configured to offer a 3.1 surround-sound presentation, with left-channel, centre-channel and right-channel speaker arrays inside the soundbar, and each can stream wirelessly via Bluetooth. In addition, the HTL5160B and HTL3160B both feature a wireless subwoofer and one-touch NFC pairing. The HTL5160B also has integrated Spotify Connect and Google Cast, plus an HDMI input. The HTL5160B is a 320W design, and will cost €350 (£260). The HTL3160B has 200W of power and will sell for €230 (£170), while the HTL2183B has 150W and will cost €170 (£125). All three will be on sale from next month.